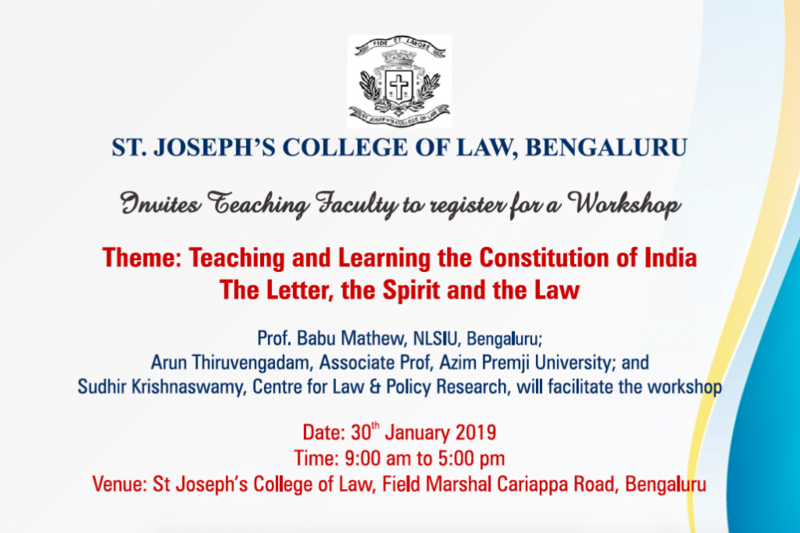 On 30th January 2019, St. Joseph’s College of Law will host a workshop for law and political science teachers across colleges in Bangalore, “Teaching and Learning the Constitution of India: The Letter, the Spirit and the Law”. The workshop aims in-part to introduce law and social science educators to new methods of teaching the Constitution, especially methods which make use of “technologies of learning and the internet”. The Centre for Law and Policy Research (CLPR) will run Session III on “Resources and Skills: Exploring Pedagogies and Resources to combat the Challenges”. CLPR has developed two websites — CADIndia and the Supreme Court Observer — that host critical materials on India’s constitutional origins and the working of the Supreme Court in an easily accessible, interactive and digital format. The Session will introduce participants to a pedagogically nuanced workshop model that leverages these digital resources to teach the Indian Constitution effectively and facilitate deep engagement with India’s constitutional tradition.